Americans love to create an exotic part of the world in their own neighborhoods. These wooden panel doors look like they belong in Greece, Italy, the French countryside, the Caribbean, or Spain. 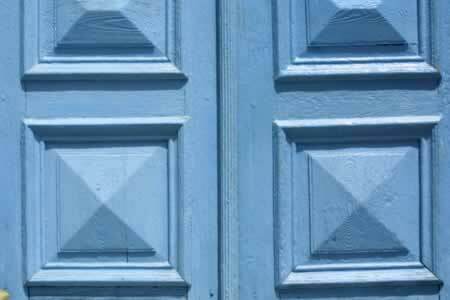 But you'll also find bright blue, ornamented doors with raised panels in the American South, the East Coast, and the Southwest. If you're doing a period restoration, wood paneled doors create a feel that other materials can only approximate. This set would look outstanding against any number of exteriors: terra cotta, brick, stone, or shingle. Double-door frames, with or without transoms, have played a rich role in the tradition of row houses, Continental farm homes, and Italianate architecture. They can distinguish your home from common-wall dwellings, or burst out in joy from aged or distressed walls. Expert craftsmanship on raised panels, fluted casings, and architraves can create a door gallery that dazzles.